I used to make buddha bowls all of the time and for whatever reason I stopped! It's like that with anything. We sometimes go through phases. But while we were on holiday about a week ago, we were eating out at some of our favourite health food restaurants in Toronto and I was really inspired by some of the lunch bowls I was having. They were delicious and not overly complicated either. And so, that's how the mighty bowl is back in my life once again! The best part about bowls is that you get a little bit of everything: leafy greens, variety of vegetables, sometimes something pickled or brine-y like olives, proteins of choice and a really delicious dressing. You can go vegan, vegetarian, paleo, gluten-free or grain-free with your bowls, you can go mediterranean, Mexican, Thai inspired - the possibilities are endless. Pin me 👆🏽to save me for later! There was this one bowl (of many) that we had at Impact Kitchen in Toronto that was drool-worthy! So freaking good. I knew I wanted to replicate it and put my own spin on it. So that's exactly what I did. Side note - if you've never been, you MUST go! My Quinoa Power Bowl is warming, grounding and 100% satiating. For my proteins, I chose quinoa and organic bacon. But you could easily keep this dish plant based and add some raw nuts and seeds or switch the bacon for grass-fed steak slices. It also contains fresh arugula which is peppery. I roasted up some hearty vegetables like brussels and stained my cauliflower with turmeric which adds a really nice bitter note to the dish (trust me!). The pickled onion just sets this dish apart in my opinion - the acid from the vinegar just takes it next level. And then it gets drizzled with the maple vinaigrette which is both sweet and tart. * I like to really quickly pickle my onions for this dish. About 1-4 hours (depending on your timing) before you're ready to make this dish prepare a bowl with 1/3 cup raw apple cider vinegar, 2 tsp coconut sugar, pinch of sea sat and 1 cup warm water - whisk. Take 1/2 red onion and thinly slice it into half moons, place it into your pickling liquid and cover with a paper towel. Leave it sitting for 1-4 hours. Drain liquid when you're ready to consume. Yes, it's one extra step (and you don't have to do it) but it really makes this dish special. Pre-heat oven to 425F and line 2 baking sheets with parchment paper. Once your bacon is cooked, remove it and set it on a plate lined with a paper towel. Prep your vegetables. Quarter and wash your brussels sprouts. Toss them in a little olive oil, garlic powder, sea salt and pepper. Lay them out on one of the parchment lined baking trays. Try not to overcrowd the vegetables. Cut cauliflower into very small florets, wash and then toss them in a little olive oil, garlic powder, turmeric, sea salt and pepper. Lay them out onto the other parchment lined baking trays. Try not to overcrowd the vegetables. Place both trays into the oven for approximately 15-20 minutes. 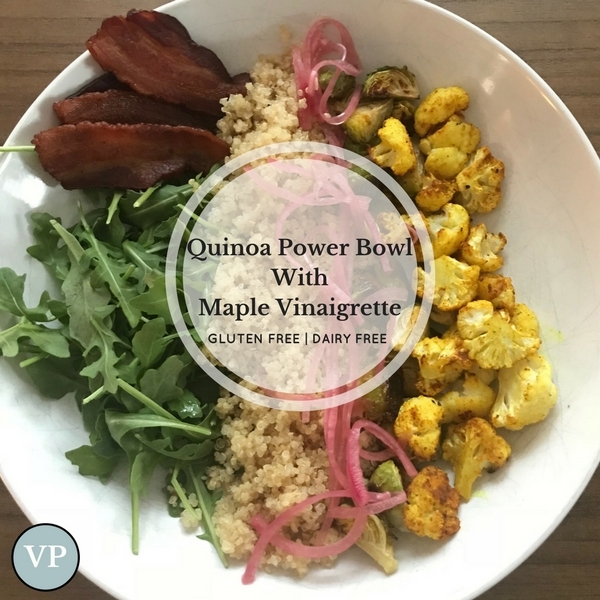 Once your vegetables are cooked, prepare your bowls: Start with a handful of fresh arugula, cooked quinoa, a couple of pieces of bacon per bowl, roasted brussels and turmeric cauliflower, pickled red onions and drizzle with maple vinaigrette. Whisk all ingredients together in a bowl or vigorously shake in a mason jar. I wanna know! Have you tried a buddha bowl or grain bowl before? Did you love this recipe? Get more each week by joining my newsletter and get access to my FREE resource library.